The classic etiology of TM is ulcerative colitis, but Crohn’s disease has gradually taken its place since 1950 when it was discovered to predispose patients to TM.6 Other etiologies have also been identified. They include Shigella, salmonella, entamoeba, campylobacter, ischemic colitis, cytomegalovirus (CMV) and Kaposi’s sarcoma in immunosuppressed patients 2,6. We present the case of a patient with sepsis of abdominal origin. The initial focus was typical cholangitis, so diagnostic laparoscopy was performed due to clinical deterioration. Macroscopic evidence of TM led to total colectomy plus ileostomy. This diagnosis was subsequently confirmed by the pathology report. On this occasion, no clear etiology was found, so this episode of TM was classified as of possible idiopathic origin. The patient was a 54-year-old woman with a history of hypertension, hypothyroidism and morbid obesity (body mass index [BMI]: 50.2). Her conditions were being managed with verapamil, levothyroxine, acetylsalicylic acid and atorvastatin. She was admitted to a level one emergency department after four days of fever, right hemisphere abdominal pain radiating to the ipsilateral lumbar region, asthenia, adynamia and tremors. The first level paraclinical tests found thrombocytopenia, so they remitted her to a more advanced level hospital due to their suspicion of arbovirus. She was admitted to the emergency department in poor condition with rapid respiration, dehydration, fever and somnolence. She subsequently developed respiratory insufficiency and was rapidly intubed without complications. She was transferred to the intensive care unit (ICU), and additional paraclinical tests found thrombocytopenia (70,000), metabolic acidosis with hyperlactatemia and kidney injury Acute Kidney Injury Network (AKIN) level III kidney damage. It was considered that the patient was suffering from septic shock and possible pyelonephritis, so treatment with antibiotics using piperacillin tazobactam was combined with resuscitation by goals, inotropic support, management of comorbidities and microbiological tracking. Her evolution during her hospital stay was torpid. She presented oligoanuria, distal hypoperfusion, borderline blood pressure and jaundice in the sclera. Folow up tests showed that her leukocytosis had increased and also indicated neutrophilia, thrombocytopenia, moderate metabolic acidosis with an elevated anion gap, normal transaminases and amylase, renal function deterioration, and direct hyperbilirubinemia with an obstructive pattern. Her chest X-rays were normal. Hepatobiliary ultrasound was requested due to a suspicion of type III cholangitis secondary to obstruction of the biliary tract, and antibiotic management was staggered with ertapenem. Due to deterioration of renal function, she was evaluated in the nephrology service which initiated renal replacement therapy with hemodialysis. The results of requested blood cultures reported findings of multi-resistant Escherichia coli. 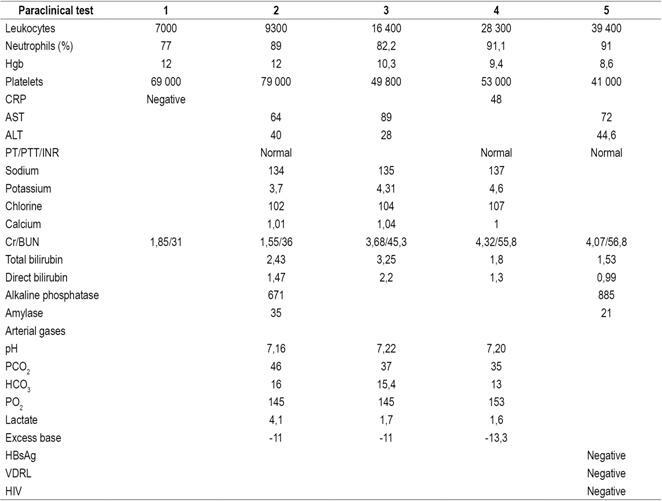 A urine culture was negative (Table 1). BUN: blood urea nitrogen; Cr: creatinine; HBsAg: hepatitis B surface antigen; HCO3: bicarbonate; INR: international normalized index; PCO2: partial carbon dioxide pressure; CRP: C-reactive protein; PO2: partial oxygen pressure; PT: prothrombin time; PTT: partial thromboplastin time; AST: Aspartate transaminase; ALT: alanine transaminase; VDRL: Venereal Disease Research Laboratory test; HIV: human immunodeficiency virus. Since the ultrasound report did not show a vesicular lithiasis or dilation of the bile duct, a septic process of biliary origin was ruled out. Subsequently, abdominal distension became evident in the patient. The general surgery service performed diagnostic laparoscopy and found evident amounts of free fluid in the abdominal cavity, predominantly from a right parietal colic leak associated with marked distention of the entire colon but with no evidence of mechanical obstruction. The procedure was converted into exploratory laparotomy due to findings of TM (Figure 1) and a total colectomy plus ileostomy was performed. In addition, patient was treated with ceftriaxone, oral vancomycin and metronidazole for c. difficile, salmonella, Shigella and campylobacter. 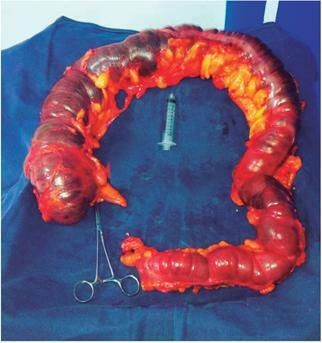 Figure 1 Total colectomy, suspicion of toxic megacolon. The pathology report for the colon and a segment of the terminal ileum showed TM with severe luminal dilation of the cecum to the sigmoid measuring 22 cm in circumference and 107 cm in length. It also showed flattening of the mucosa and peripheral layers of the wall without inflammation of the mucosa or wall, suggestive of ulcerative colitis or Crohn’s disease. During the postoperative period, the patient improved clinically in terms of leukocytosis, increased urinary output, decreased Cr and a better pattern of arterial blood gases. Vasopressor support was decreased. On the other hand, no signs of infection were observed in the surgical wound. On the eighth day following surgery the patient had no need for respiratory support and was hemodynamically stable. Sudden onset of dyspnea was observed with evidence of cardiorespiratory arrest. The blue code for advanced resuscitation maneuvers was activated. After 20 minutes without success, the patient succumbed with pulmonary thromboembolism as a possible cause of death. Although the pathophysiological mechanism of this disease has not yet been fully elucidated, some studies show severe and progressive infiltration of the neutrophil-mediated inflammatory response that manages to compromise the mucosa through the smooth muscle layer to the serosa. 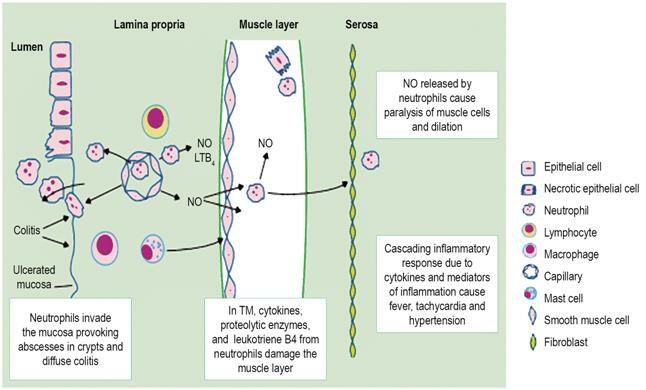 As inflammation progresses, neutrophils invade the muscle layer and cause additional damage by releasing proteolytic enzymes, cytokines, and leukotriene B4 (LTB4) resulting in dysmotility and consequent secondary dilation of the colon (Figure 2). 1 In addition, infectious agents such as pseudomembranous colitis and toxins A and B of C. difficile can interrupt the epithelial barrier and cause epithelial cell necrosis and electrophysiological changes in the colonic mucosa resulting in marked inflammation of the colon 8. Figure 2 Neutrophil invasion through colon walls. LTB4: leukotriene B4; NO: nitric oxide. Taken from: Sheth SG et al. Lancet. 1998; 351 (9101): 509-13. In relation to the case presented here, there is very little literature regarding TM cases masked by suspected acute cholangitis. 22. It is important to emphasize that the patient had poor prognostic factors including age over forty, hypoalbuminemia, renal failure and hyperlactatemia. These factors increased her risk of mortality exponentially. In addition, no risk factors for pseudomembranous colitis were identified. After the surgical intervention, the patient presented clear clinical improvement, but a secondary entity, possibly pulmonary thromboembolism, caused death. TM is a well-recognized and highly lethal complication of acute colitis. Physicians should expect an increase in the incidence of TM due to the increasing number of acute colitis cases associated with the use of broad spectrum antibiotics and co-infections of strains of hypervirulent C. difficile resistant to conventional therapies. It is essential that patients with TM be diagnosed quickly and correctly, and managed comprehensively to reduce morbidity and mortality. Emergency physicians can minimize excessive delays in diagnosis by suspecting and ruling out this entity in all patients with abdominal distension, acute or chronic diarrhea, and signs of systemic inflammatory response and, thus, improve the prognoses of these patients.